The second part of my learning kaiseki series! This time I had the chance to head to Kikunoi Roan Kiyamachi! 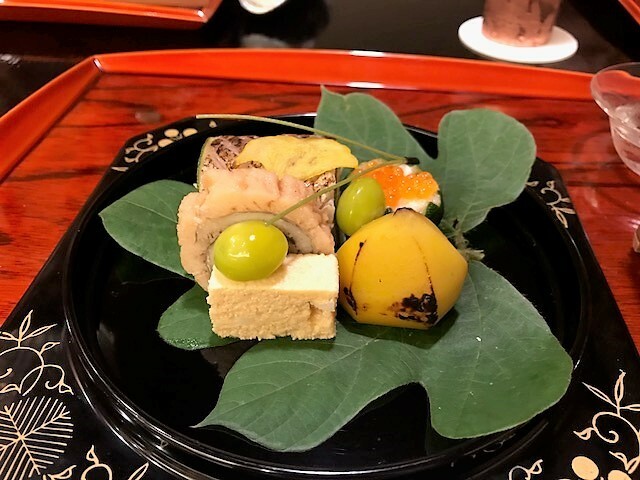 I’m going to try really hard to relay the excitement of kaiseki cuisine to you, my dear readers! Kikunoi Roan is located just a short walk away from Hankyu Kawaramachi Station (I have a really bad sense of direction, but even I could find it right away! lol). I was a bit nervous going to it, as it has two Michelin stars. Before going into the restaurant, I want to tell you a bit about its history. The restaurant was founded in 1912, which was the first year of the reign of Emperor Taisho, as the sister-restaurant of the ryokan Kikunoi. Murata Yoshiharu, who is the Kikunoi’s CEO’s little brother, is now the one in charge of the restaurant, after becoming independent in the “sharing of the noren curtain” or noren wake style. The prices of this restaurant are cheaper than the main restaurant near Kodai-ji Temple. So, about my visit to the restaurant, I felt very welcome, as when I entered the restaurant, all the chefs together said: “Welcome, Miss Abe!” (My surname is Abe). I felt so welcome to this restaurant! The restaurant is brightly lit, clean, and felt refreshing. The staff moved fast, they were energetic, and I felt like I could enjoy a delicious meal here. When I looked around me after I had sat down, I saw that some of the customers were visitors from overseas. The chefs explained the dishes to them in English, and they enjoyed eating while listening to the explanations. I thought it wonderful that their level of service was so nice to everyone. So now it was time to order. This time I had the 13,000 yen (+tax and service charge) fixed menu. This course contains 11 dishes. Compared to the last time it was a bit expensive, but I felt that the service and food here are worth it. Each dish here was delicious, but like last time, I’m going to write about the ones that left an especially nice impression on me! This is a Hassun platter, and it is the most visually striking dish in kaiseki. It’s very beautiful, as the chef can freely decorate the dish using seasonal flowers and leaves, representing the current season. It’s fun just to look at it. It was late September when I went to Kikunoi Roan, and this plate was in an artistic insect cage like thing that made me feel like it was autumn. In Japan, autumn is a time when it’s customary to enjoy the song of the Suzumushi (bell-ring crickets). I wonder how those visiting Japan from overseas view these things. This is ayu sweetfish with roe. It’s interesting how skillfully they’re grilled: they look just like they were still swimming in the river! 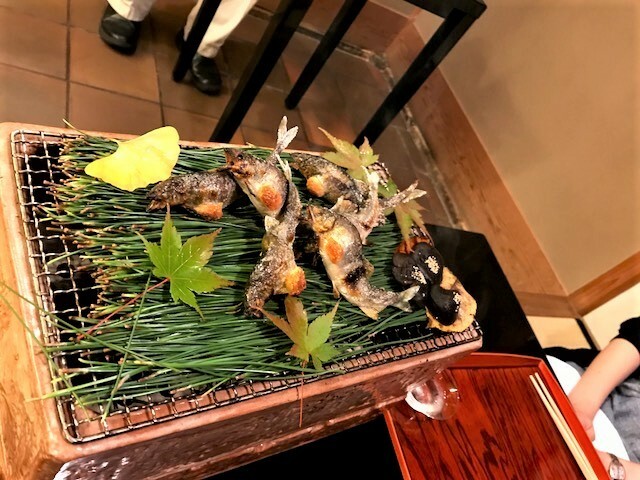 There are pine needles under the fish, and because of the charcoal inside this little grill, there is a very nice fragrance in the air when this dish is brought to you. 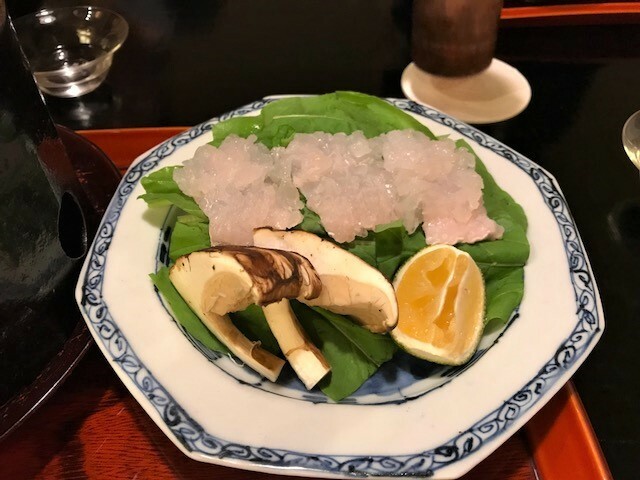 By the way, ayu sweetfish can often be had as a part of kaiseki cuisine in Kyoto from summer to autumn. There are many ways to cook ayu, but this time because it was autumn, the ayu contained roe, so their stomachs had been sliced before cooking so that the roe won’t burst out. So cool! 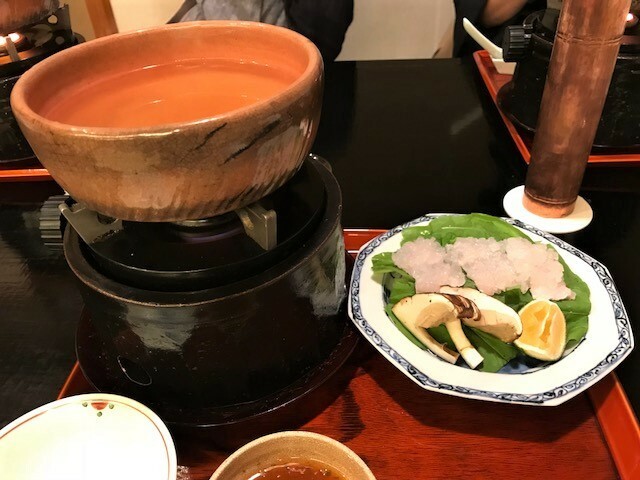 The last one is a shabushabu hotpot with daggertooth pike conger and matsutake mushroom. You get to dip both the conger eel and matsutake mushroom into the delicious dashi broth. Like the ones above, these products are also often used in kaiseki from summer to autumn. Daggertooth pike conger is an important part of the summer of Kyoto when there are not that many fish you can catch, and it can be enjoyed boiled, grilled, fried… in so many ways. The taste of daggertooth pike conger is light so it won’t overpower the delicate taste of the dashi broth. I had it as shabushabu this time and got to enjoy the crunchiness of the texture and the gentleness of the dashi broth. They use a gas range to boil the dashi broth is right in front of you, but it still doesn’t make the room feel hot; it felt very comfortable. You can feel the season with your five senses! 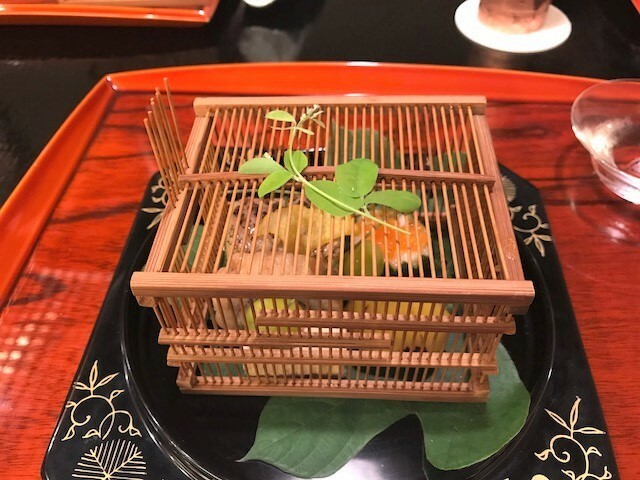 It’s important in kaiseki cuisine to represent the season, but in this restaurant it's not only represented in the taste, but the seasons can also be felt in how the dish is served in an insect cage; how the ayu sweetfish is served on fragrant pine needles, so you can also enjoy the season with your eyes and nose, and not only with your tongue. The dishes were explained in a friendly manner (they even answered my stupid questions)! When I was talking with my colleague about what kind of ingredients the dish we were eating contained, a chef heard this, and showed us the ingredient as he was explaining what it was! They answered my stupid questions in a kind and gentle manner. They explained to the visitors from overseas about the ingredients in proper English. If the ingredient was hard to explain in English, they, like with me, showed the ingredient to the patron and explained it with the real thing. This is a bit of a postscript, but here are the things I found especially nice: I couldn’t eat all the rice you’re served as the last dish before the dessert, but they made an onigiri rice ball of it for me so I could take it home. Even to the last moment, I was enjoying myself, and could contently start heading home. Next, I’m going to Wagokoro Izumi! I hope you will read my article about it too! At Kikunoi Roan, I felt like I truly was in a restaurant that had received two Michelin stars (and it had!). The service, atmosphere… saying that everything was perfect would not be an overstatement here.